While we are enjoying some extra snuggle time with the Monkeys, we are so pleased to be able to bring you a series of posts from some of our favorite bloggers. Today’s post comes to you from Carolyn of The Pleasantest Thing. Carolyn and I are fellow members of Kid Blogger Network and share a dedication to natural parenting. When I was expecting Baby Monkey, I knew I wanted to learn more about baby wearing, since I only had experience with a couple carriers. Carolyn kindly volunteered to write a post comparing carriers, despite the fact that she is a well-established blogger and really didn’t know me well. In other words, she had no personal obligation to help me out, she was just being kind! So help me return the favor by visiting her incredible blog – you won’t be disappointed! Hi! I’m excited to be posting here at All Done Monkey. Thank you for having me. I’ve gotten so much use out of our baby carriers, that today I wanted to share some of the insight into the different options for baby carriers. I knew when I was first pregnant that I would want to try baby wearing. It felt natural. I could hold my little guy close, and still be able to move around. He’s happy, and I’m happy. I’ve had two children, and both of them spent hours and hours snuggled close to me or my husband, in a carrier. Our youngest is now 18 months, and we still use our Ergo carrier with him! However, once I made the decision to try baby wearing, I was overwhelmed by all the choices. I searched and comparison shopped, and still couldn’t get a good picture of which type if baby carrier would suit me best. I’ve had experience with 4 different types of slings, and I have a short review of them below, giving the advantages and drawbacks to each. I’ve tried two different sling carriers: one pouch (non-adjustable, one piece of fabric) and one double ring sling (an adjustable sling). I like sling carriers because they are so cozy, nestling the baby near my heart. Using sling also makes peeking down checking the baby easy. Pouch Sling: This was the first sling I used. It’s great because it does not need to be adjusted. Once you know how to position it, you’re set. My older son, a long and thin baby, spent many hours sleeping in his pouch sling. My younger son, a long and chubby baby, never fit as well into the pouch sling, and cried in it. I only used it rarely for him. Double Ring Sling: I only had the Maya wrap for my second son. Once I figure out how to use it, I loved it. I also love that it has a “tail” of fabric hanging over, that could be used to cover your baby (for shade, for warmth, for privacy while nursing). I also have experience with 2 different brands of soft structured carriers: the Baby Bjorn, and the Ergo. These carriers are especially great for long trips outside, as they distribute the weight more evenly. that made it possible to use this carrier from the beginning. Once my son outgrew the insert, I used continued to use it, without needing to worry about positioning the insert. The version I have has a hood, which is great for shade or for privacy while nursing. (Once we were out and someone asked my husband if we breastfed our baby. He pointed at me and said, “I think she’s nursing him right now.” No one could tell under the wrap). You can also use this as a back carrier. : In this carrier, your child can face forwards or toward you. The drawbacks are that the hip placement and head control necessary to use the carrier make it only useful after your baby is a few months old. Also, in order to have any coverage while nursing you would need to put a cover or a blanket over the baby. I personally did not find it to be as comfortable as the other options. This varies from person to person. The Baby Bjorn was my husband’s carrier of choice. He used it until our sons outgrew it. 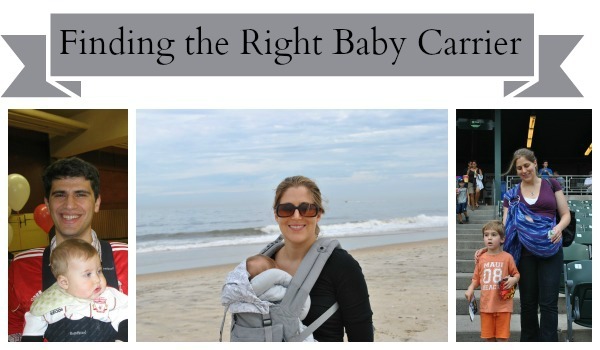 Once you decide on the type of carrier you want, check out my tips on using baby carriers. Thank you for letting me share with you today! Carolyn is the writer at The Pleasantest Thing, a website focused on play. She shares play times full of laughter, learning, and imagination. Join in their fun on Facebook, Pinterest, Google Plus, or Twitter. Great post; however, FYI — the green carrier shown under Soft Structured Carriers is actually and Ergo Baby carrier, not a Baby Bjorn. We have the Ergo Baby for our son and LOVE it, can carry him in front, on the hip or on our backs up to 45 lbs. It’s super comfortable and has been invaluable when we travel. Our son is also adopted, and the Ergo Baby was so helpful with bonding when we first brought him home at 16 months. Gretchyn, thanks for stopping by! You’re right – that is an Ergo. It is intended to go with the paragraph above it, not below. The photo for the Baby Bjorn is below the following paragraph. In any case, we also love our Ergo. They are so sturdy yet snuggly. That is so sweet about the special bonding with your son. What a great testament!